Trying to find the latest social media statistics for Facebook, Twitter, Instagram, LinkedIn, etc. Here is my collection of articles on that subject. 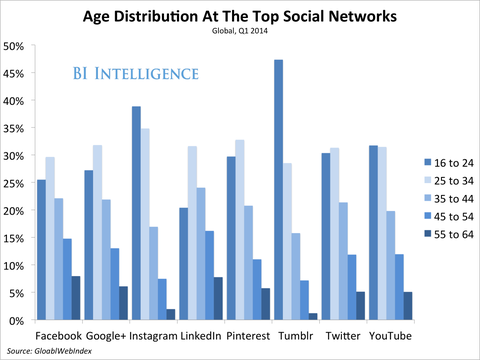 Where to find latest numbers: Facebook, LinkedIn, Twitter, Instagram, Snapchat, Vine, tumblr. April 16, 2019: Facebook Stories has 300 million daily active users and Instagram Stories has 500 million daily active users. April 11, 2019: Pinterest has 265 million monthly active users. 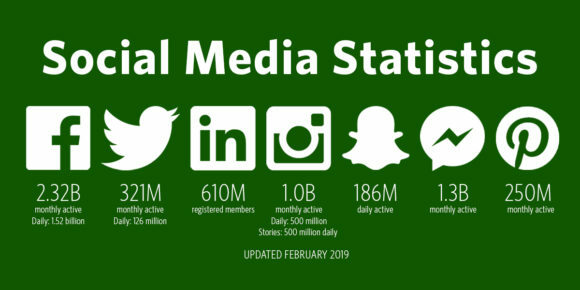 Feb. 6, 2019: Twitter reports 321 million monthly active users (down from 330 million) and 126 million “monetizeable” daily active users (up from 124 million). Feb. 5, 2019: Snap said daily active users were flat in the fourth quarter at 186m, stabilizing after two consecutive quarters of declines. Feb. 5, 2019: YouTube now has 2 billion monthly active users. Jan. 31, 2019: Facebook has 2.32 billion monthly active users and 1.52 billion daily active users. Jan. 15, 2019: TikTok announces it has 250 million daily active users. Oct. 30, 2018: Facebook now has 2.27 billion monthly users and 1.49 billion daily active users. Both numbers are up, but lower than projections. And daily users are flat in U.S. and Canada. Oct. 25, 2018: Snap reports 186 million daily users, its second straight quarter of declining users. Oct. 25, 2018: Twitter reports 326 million monthly active users, four million fewer than it had one year ago. August 7, 2018: Snapchat shrinks by 3 million users to 188 million daily active users. July 27, 2018: Twitter posts record Q2 profit of $100M, but monthly users fell by 1 million from Q1 to 335M due to removing fake accounts. July 25, 2018: Facebook reports 1.47 billion daily active users, up 11% year-over-year and 2.23 billion monthly actives. July 25, 2018: Facebook says 2.5B people used at least one of either Facebook, Instagram, WhatsApp, or Messenger in June. June 25, 2018: Instagram is estimated to be worth more than $100 billion, and estimated to have 2 billion users within five years. June 20, 2018: Instagram announces it has 1 billion monthly active users, up from 800 million in Sept. 2017. May 1, 2018: Snapchat has 191 million daily active users. April 25, 2018: Facebook now has 1.45 billion daily active users and 2.2 billion monthly active users. April 25, 2018: Twitter now has 336 million monthly active users, says daily active users are up 10 percent year-over-year. April 20, 2018: Reddit has 330 million monthly active users. March 1, 2018: A new Pew Research Center survey of U.S. adults finds that the social media landscape in early 2018 is defined by a mix of long-standing trends and newly emerging narratives. Feb. 8, 2018: Twitter posts first real profit. Monthly active users steady at 330 million. The company doesn’t report daily active users, but they report daily actives are up 12 percent from last year. Feb. 6, 2018: Snapchat reports 187 daily active users – up 9 million from previous quarter. Jan. 31, 2018: Whatsapp has 1.5 billion users. Jan. 31, 2018: Facebook has 184 million users in the U.S. and Canada – down for the first time ever. Jan. 31, 2018: Facebook reports 2.13 monthly active users and 1.40 billion daily active users. Jan. 21, 2018: WeChat says it now has 980M monthly active users, claims 170M daily active users for its Mini Program app platform, which now has 580,000 apps. Dec. 13, 2017: Facebook details Messenger’s 2017: over 7B daily conversations; 17B realtime video chats, up 2X over 2016; 2.5M new groups started daily, averaging 10 people. Nov. 7, 2017: Snapchat reports 178 million daily active users, up 3% from Q2. Nov. 1, 2017: Facebook reports 2.06 billion monthly active users and 1.37 billion daily active users. Sept. 25, 2017: Instagram now has 800 million monthly and 500 million daily active users. Sept. 14, 2017: Facebook Messenger has 1.3 billion monthly active users. Sept. 13, 2017: Slack has 6 million daily active users. Aug. 10, 2017: How many users does Snapchat have? The company says it has 173 million daily active users as of the end of July 2017. July 27, 2017: WhatsApp Status (its Snapchat clone) reaches 250 million daily active users. July 27, 2017: Twitter is estimated to have 157 million daily active users. July 27, 2017: Twitter reports 328 million monthly active users – unchanged from the previous quarter. 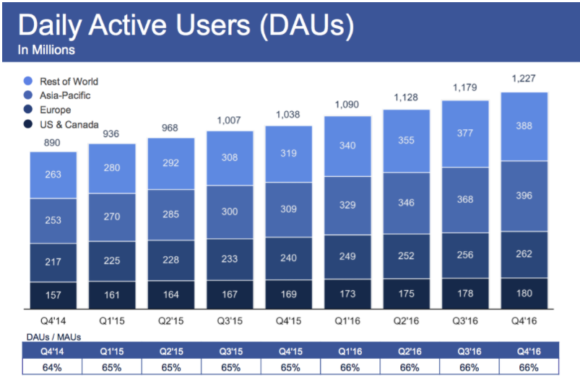 July 26, 2017: Facebook reports 1.32 billion daily active users on average for June 2017, an increase of 17% year-over-year. It also reports 2.01 billion monthly active users as of June 30, 2017, an increase of 17% year-over-year. May 17, 2017: Google Photos now has 500 million monthly users. May 10, 2017: Snapchat has 166 million daily active users, an increase of 36% year-over-year. April 26, 2017: Instagram announces it has 700 million active users, four months after reaching 600 million. April 24, 2017: LinkedIn announces that it has 500 million members (not necessarily active users). April 13, 2017: Instagram Stories now has 200 million daily active users. April 12, 2017: Facebook Messenger has 1.2 billion monthly active users. April 11, 2017: Instagram Direct has 375 million monthly active users. March 22, 2017: Instagram announces it has more than 1 million advertisers. March 21, 2017: Pinterest expects to make $500 million in revenue this year. Feb. 9, 2017: Twitter’s monthly active users grew to 319 million, up from 317 million in the prior quarter. Feb. 2, 2017: Snapchat reportedly has 160 million daily active users in advance of its IPO. The actual number filed with the SEC was 158 million daily users. Feb. 1, 2017: Facebook’s Q4 2016 numbers show it has 1.86 billion monthly active users and 1.23 billion daily active users. That’s up from 1.84 billion and 1.21 the previous quarter. Jan. 11, 2017: Instagram Stories has 150 million daily active users, out of a total Instagram user base of about 600 million. Dec. 6, 2016: Musical.ly has 40 million monthly active users. Oct. 13, 2016: Pinterest has 150 million monthly active users. Oct. 6, 2016: Instagram stories have 100 million daily users. Sept. 27, 2016: Facebook says there are 60 million businesses with pages and 4 million buy ads. Sept. 26, 2016: Snapchat passes 60 million daily users in the U.S. and Canada. August 26, 2016: Snapchat is on pace for 217 million users by end of 2017. July 20, 2016: Facebook Messenger reaches 1 billion monthly active users. June 21, 2016: Instagram now has 500 million users – and more than 300 of them use it every single day. June 21, 2016: Twitter says video Tweets on the social network have increased by over 50% since the beginning of 2016. June 2, 2016: Snapchat has a reported 150 million daily users, more than Twitter. May 24, 2016: Snapchat is reportedly valued at $20 billion. April 28, 2016: Snapchat now gets 10 billion video views per day. March 4, 2016: Snapchat’s latest fundraising raise values them at $16 billion. Feb. 24, 2016: Telegram reports that 100 million people use the free encrypted messaging app every month, up from 60 million people last May. Feb. 23, 2016: Twitter says video views on Twitter grew by 220X from the end of 2014 to the end of 2015. Feb. 1, 2016: Facebook-owned WhatsApp now has 1 billion monthly active users. Thats up from 900 million three months ago. Jan. 15, 2016: Twitter says 1.7 billion votes have been cast in Twitter polls since its launch in October. Jan. 12, 2016: Snapchat has 7 billion video views per day, compared to 8 billion for Facebook. Jan. 8, 2016: Facebook Messenger has 800 million monthly active users. Nov. 8, 2015: Snapchat’s advertising page says it has more than 100 million daily active users. Nov. 8, 2015: Snapchat gets 6 billion video views per day. Sept. 22, 2015: Instagram announced in a blog post that it now has more than 400 million monthly active users. Sept. 2, 2015: Snapchat gets 4 billion video views per day. Sept. 1, 2015: Instagram says more than 85 million people use Direct every month. Aug. 24, 2015: For the first time ever, one billion people used Facebook in a single day, according to Mark Zuckerberg. May 26, 2015: Snapchat has nearly 100 million daily active users, CEO Evan Spiegel said on stage at Re/code’s Code Conference. May 26, 2015: Snapchat reports that “more than 60 percent of 13- to 34-year-old smartphone users in the U.S. are active on the service and together view more than 2 billion videos a day,” via a Bloomberg article. 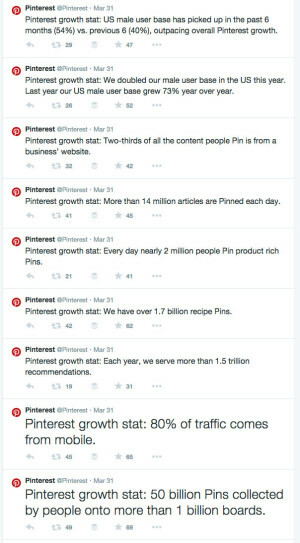 March 31, 2015: Pinterest turned 5 and released some stats via Twitter. Most interesting: doubled male user base in last year and 80% of traffic from mobile. Click the image below to see bigger. March 25, 2015: Facebook shared some numbers from its family of apps at its F8 conference. The Groups app has 700 million users, WhatsApp has 700 million, Facebook has 1.4 billion, messenger has 600 million and Instagram has 300 million. These numbers are the “user base,” so not necessarily monthly active users. March 16, 2015: Pinterest is valued at $11 billion. Feb. 18, 2015: Snapchat is seeking investors at a $16-19 billion evaluation. The story also mentions that Snapchat users send more than 700 million disappearing “snaps” and view more than 500 million stories daily. Feb. 5, 2015: Twitter reports it has 288 million monthly active users. Feb. 5, 2014: LinkedIn says it has 347 million registered members. 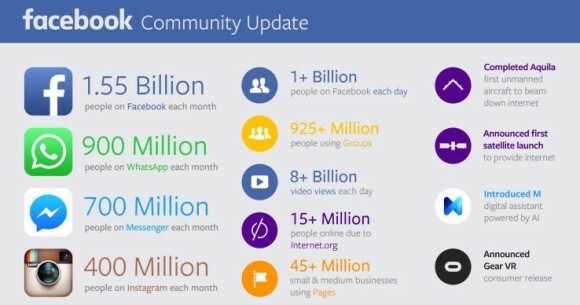 Jan. 29, 2015: Facebook reports 1.39 billion monthly active users and 1.19 billion on mobile. Daily active users is at 890 million and daily mobile active users is 745 million. Jan. 19, 2015: 8.5% of Twitter’s users are bots. Dec. 10, 2014: Instagram announces that it has 300 million users who share 70 million photos and videos every day. Oct. 28, 2014: Twitter reports monthly active users at 284 million, with 80 percent on mobile. Oct. 28, 2014: Facebook up to 1.35 billion monthly users and 1.12 billion on mobile. Sept. 25, 2014: Who is using various social media networks. Aug. 18, 2014: Facebook blog says 2.4 million videos related to the ice bucket challenge shared between June 1 – August 17. Aug. 1, 2014: LinkedIn announces it has 313 million members. June 30, 2014: Twitter’s Average Monthly Active Users (MAUs) reported at 271 million, an increase of 24% year-over-year. April 29, 2014: Twitter announced in earnings call that monthly active users is 255 million. 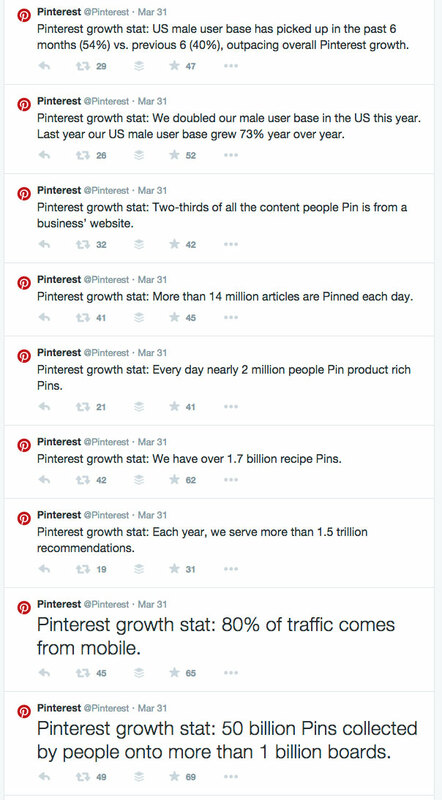 April 24, 2014: Pinterest mentioned in a blog post that is now has more than 30 billion pins. April 23, 2014: Facebook announces it has 1 billion monthly mobile users (1.01 billion mobile monthly active users as of March 31, 2014). April 18, 2014: LinkedIn reports that it has passed 300 million users. 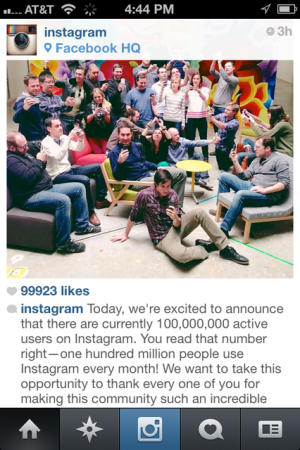 March 26, 2014: Instagram announces it now has 200 million users. March 26, 2014: Facebook has 1 billion active monthly users on mobile. Feb. 5, 2014: Twitter reports that it has 241 million monthly active users and 184 million monthly active mobile users. Jan. 2014: LinkedIn site says it has more than 259 million members in over 200 countries and territories. Dec. 31, 2013: Facebook reports 945 million monthly active users on mobile products, 757 million daily active users on average in December 2013 and 1.23 billion monthly active users. Dec. 12, 2013: 75 million people use Instagram daily. Nov. 19, 2013: Snapchat reports user “receive” 400 million snaps per day. That’s as many photos as shared on Facebook and Instagram combined. Here’s a little more info on why this number is misleading. Nov. 4, 2013: Here’s some more data on Twitter, including this: It has 232 million monthly active users, but 40% of them don’t actually tweet. Nov. 2013: The Twitter Company Page reports these stats: 230+ million monthly active users, 500 million Tweets are sent per day, 76% of Twitter active users are on mobile, 77% of accounts are outside the U.S., Twitter supports 35+ languages. Oct. 30, 2013: Facebook reports it has 728 million daily active users as of Sept. 2013 (up 25% year-over-year), 1.19 billion monthly active users as of Sept. 2013 (up 18% year-over-year), 874 million mobile monthly active user as of Sept. 2013 (up 45%) and 507 million mobile daily active users. Oct. 29, 2013: Google+ has 540 million monthly active users and 300 million monthly active “in-stream” users. 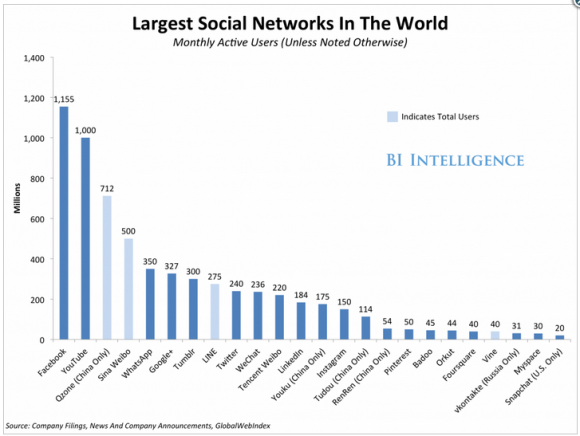 Oct. 2013: Business Insider shared this list of the largest social networks in the world. More info here. Sept. 9, 2013: Snapchat CEO says users share 350 million photos a day. Sept. 9. 2013: Instagram announces that it has 150 million users. August 13, 2013: More than 40% of Americans use Facebook every single day. 33% on mobile. June 3, 2013: Twitter announces that Vine has more than 13 million users. May 2, 2013: Facebook announces it has 751 million monthly active users on mobile as of the end of March. 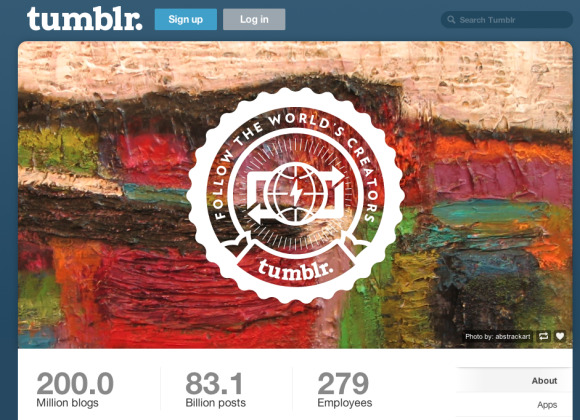 March 26, 2013: Tumblr surpasses 100 million blogs. March 20, 2013: YouTube announces it has more than a billion unique users every single month. Feb. 27, 2013: Instagram announces on its blog that it has more than 100 million monthly active users. Feb. 22, 2013: Hitwise informs us that 8.48% of clicks from U.S. search engines go to Facebook. Jan. 9, 2013 – LinkedIn reaches 200 million members and later made this infographic with more numbers. December 2012 – Facebook announces it has more than one billion active users.